Modern day neonatal intensive care necessitates the use of equipment for optimum care of sick newborn babies. Equipment alone, however, does not necessarily improve the care of the high-risk neonates. Availability of space, maintenance of asepsis and presence of adequate nursing staff are important pre-requisites before sophisticated equipments are acquired. Maintenance of the existing equipment is more important than acquisition of new gadgets. We feel that as a pediatrician, it is essential that we are aware about what to buy, where to buy, and how to use the common neonatal equipment. With this aim we are privileged to bring before you, the fourth edition of most sought after user-friendly book on key neonatal equipment. 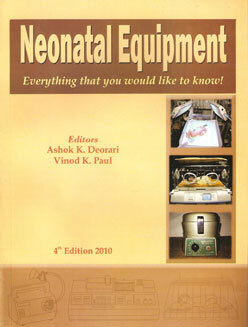 This book is a compilation contributed by a panel of distinguished neonatologists of India. Each chapter deals in detail with the principles of working of equipment and indications and practical considerations. A comprehensive table in each chapter provides information on the available models along with approximate cost and names of the dealers in Indian market. To clarify doubts in the mind of the users, frequently asked questions and answers are discussed at the end of each chapter. This revised edition has been brought out on the advice of several pediatricians, but Dr. Shankar Narayan, Train Fellow in Neonatology from the Indian Navy at AIIMS deserves special mention. A number of suggestions made by him in the earlier edition have been incorporated. Four new equipments viz. Cerebral function monitor, BERA phone, Oxygen concentrator, Laminar Flow have been included. Chapter on how to select appropriate equipment and write specifications for tender purposes have been rewritten to address the needs of user. The information on dealers and their addresses have been updated. We plan to disseminate this book throughout the country among those who care for the newborn babies. This we hope would go a long way to ensure better utilization of equipments and enhance newborn survival. We are grateful to the equipment manufacturers and suppliers, for providing details about their products. The editors are indebted to the contributors for their outstanding write-ups and to Dr. Arun Sasi, Dr. Anu Thukral, Dr. Kamal Arora, Dr. Bijan Saha, Dr. Tapas Som, Dr. Chandrakumar, Dr. Saroj Kumar, Dr. Amit Kumar, DM trainee fellows for reading the galley proofs. We would like to express appreciation to Mrs. Tessy Varghese for diligently typing the manuscript and Shri Narinder Sagar of Sagar Publication for publishing the book under his expert supervision. Kindly note, that your comments and suggestions are invaluable. We would appreciate your comments, suggestions and inputs for future editions of the book.